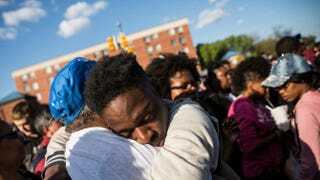 A man hugs a friend after being prayed over April 28, 2015, during a protest near the Baltimore CVS pharmacy that had been set on fire the day before during unrest after the funeral of Freddie Gray. Gray, 25, was arrested April 12, suffered a severe spinal cord injury while in police custody and died a week later. While media attention has quickly zoomed in on the burning of Baltimore, and as discussions focus on the “bad actors” and “thugs” who were destroying property and, allegedly, targeting police, there is another side of Baltimore that has been studiously overlooked, as a majority of protesters continue to do good for and by their community. The violence that happened yesterday distracted from the fact that you had seen multiple days of peaceful protests that were focused on entirely legitimate concerns of these communities in Baltimore, led by clergy and community leaders. And they were constructive and they were thoughtful, and frankly, didn’t get that much attention. And one burning building will be looped on television over and over and over again, and the thousands of demonstrators who did it the right way I think have been lost in the discussion. If our society really wanted to solve the problem, we could. It’s just it would require everybody saying this is important, this is significant—and that we don’t just pay attention to these communities when a CVS burns, and we don’t just pay attention when a young man gets shot or has his spine snapped. We’re paying attention all the time because we consider those kids our kids, and we think they’re important. And they shouldn’t be living in poverty and violence.